Melanie was continually mentally and physically abused whilst in the care of HMP, her medication was given when they felt like giving it, she was locked up for 23.5 hours a day in solitude for days on end, her cell regularly trashed and searched by the guards, even on her birthday! the worst of all, Melanie had a leg ulcer which, was closed when she went into prison, upon specialists advice she had been treating this with Manuka honey, a well known treatment for wounds that will not heal. 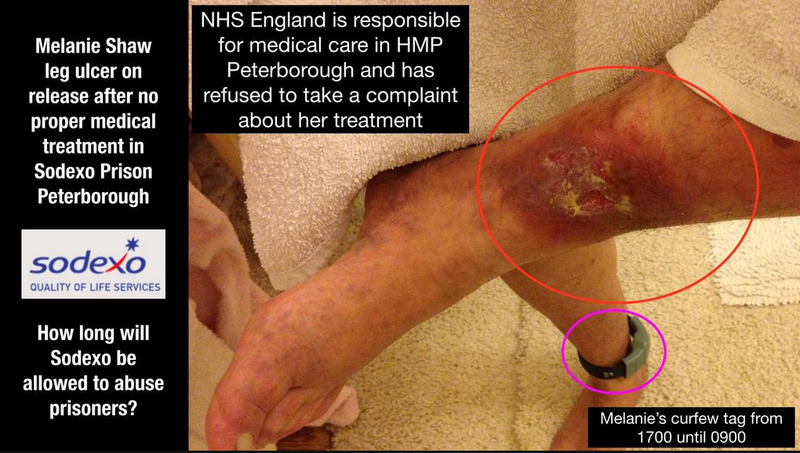 Her leg became infected again whilst in the care of HMP Peterborough and they refused to send Maline to the hospital or even supply her with the Manuka Honey, which friends had sent to the prison for her, this was thrown away! One very large pot sent by a pensioner also just thrown in the bin, and nothing was said to Melanie. Melanie will be on trial on Tuesday 28th October at Nottingham Crown Court on trumped up charges of arson, up to date, no evidence has been presented to the Courts. An inquiry into allegations that a woman who suffered a miscarriage in a prison was forced to clean up after herself has found no disciplinary action was needed. 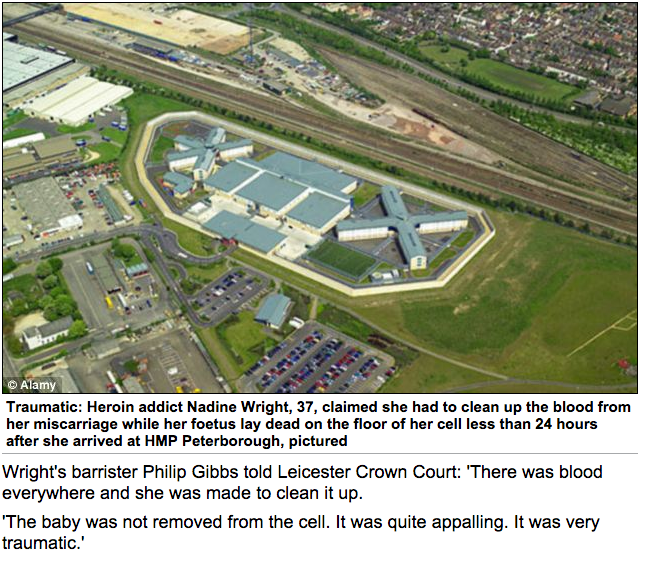 The woman lost her baby at Peterborough Prison, run by private firm Sodexo. A Sodexo inquiry found she had received the same care she would have received outside prison. Shadow justice minister Jenny Chapman said she had serious concerns about the inquiry and doubted its conclusions. “It is difficult to believe she has received the same care as she would outside prison – such as pain relief, support and counselling,” she said. Ms Chapman said she would be seeking more information from the Ministry of Justice (MoJ). Leicester Crown Court heard in December that the woman was left to clean up after herself while the foetus remained in her cell, after the miscarriage in November. The BBC has found that an inquiry by Sodexo, which runs the prison, found no-one should be disciplined. In response to a BBC Freedom of Information request, the MoJ said: “A prisoner at HMP Peterborough received medical treatment in connection with a miscarriage in the early hours of 23 November, having arrived at the prison the previous day. “She was fully assessed by a healthcare professional when she entered the prison. “Sodexo Justice Services, the prison contractor, conducted an investigation and has shared its findings with the National Offender Management Service (NOMS). “I can confirm that the Sodexo investigation found that no disciplinary action was necessary in connection with the incident. 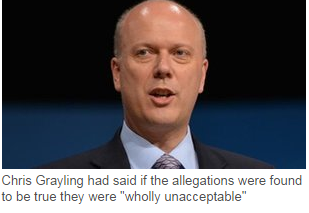 In December Justice Secretary Chris Grayling told the House of Commons, after the issue was raised by Ms Chapman, that if the claims were true it was “wholly unacceptable”. 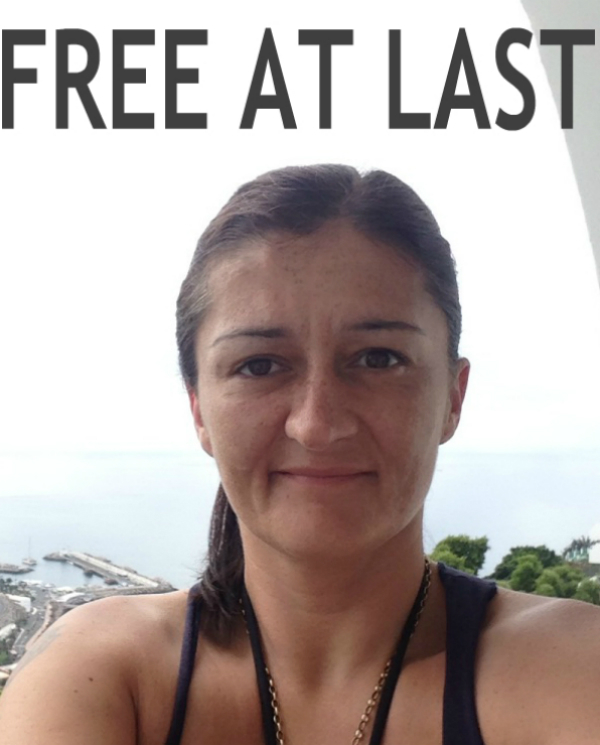 A judge yesterday ordered the release of Beechwood abuse survivor and witness MELANIE SHAW from Peterborough prison after a long awaited bail application was granted with stringent conditions attached. Melanie is set to face trial on October 28th on a charge of arson, after her neighbour’s shed burned down. A rising tide of public outrage at Melanie’s imprisonment, widely believed to be unlawful due to the absence of evidence of her involvement in the alleged incident, may have influenced the judge’s decision, some believe. The hearing was almost transferred to a private chamber at the last minute, but Judge Dickinson QC persisted with proceedings in a public court to the relief of supporters packed into the gallery. Today Melanie will travel to Plymouth where she will stay in the care of an unidentified custodian until the trial. The Prison ignoring their responsibility, so unreal! As I walked over the rail bridge and looked down the Westfield road I could see the prison on the right behind the Parks Metal fence bars, peaking above the tops of the trees with that children’s park in the foreground and the sky was a lovely blue with the sun shining bright but there where some trails causing the sky to start slowly turning that horrible dull milky white. 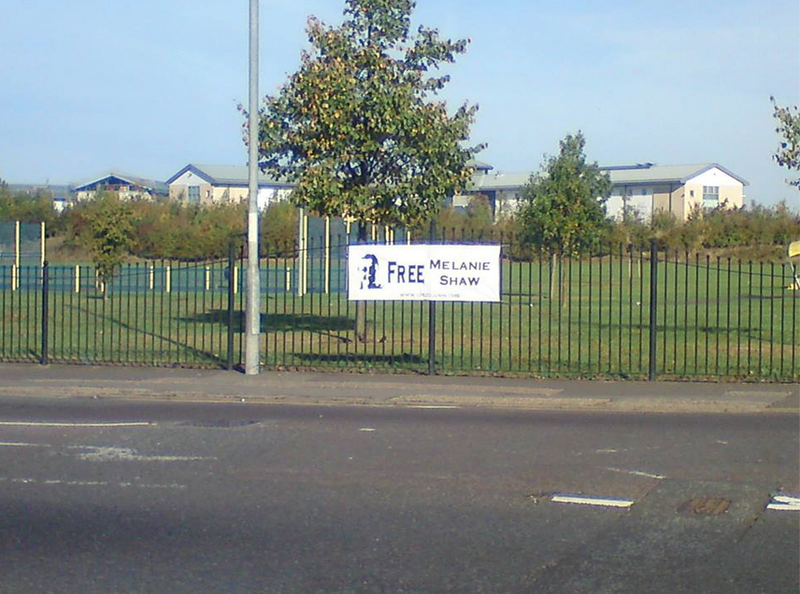 I stopped at the busy junction for Lidl and the bingo and put my bag down to get out the first large banner since this seemed a good place to put it up, just as I was attaching it to the metal bars of the park fence a Police car came over the bridge with blues and sirens going but I didn’t bat an eye lid as I finished tightening the cable ties attaching it to the bars, it was a “good” time for the police to whiz past like that! As I continued down the Westfield road past the park which seemed empty in the shadow of the prison I approached the Halcyon pub to find a few people around the back, we greeted each other and chatted briefly then I moved indoors to the bar and found Wendy in her splendid Green party tabard sitting with Kiikii and some other members of the vigil. We chatted over coffee and then the police facilitator arrived and Kiikii was distraught because it was not Stuart!! After a short while we all moved over to the park to begin the Vigil but Brian Gerrish was not yet present, there was the word going around the vigil that Brian was not coming now but then Carole arrived with bags of flyers, t shirts, stickers and ukcolumn papers and confirmed Brian was close behind and would arrive soon, the atmosphere lifted at this moment. We continued to mingle amongst ourselves holding our banners up for all the people walking past to see and then Linda helped me attach a banner to the metal fence opposite so that all the traffic going past could have no doubt as to why we where there. At this point there was maybe 50 of us in the park with banners, flyers, posters and even symbolic birthday presents “the heart of the British public”. At this point some photographers arrived so we all posed for pictures behind our banners and posters. The sun was still shining bright as the sky was began to glaze over when Brian was spotted approaching the vigil and little cheer went up, I greeted him and asked if the drive up was ok and he confirmed it was! So there we where some 50 to 60 of us and Brian gave us a little talk and an update having just been on the phone to Melanie himself that is why he was little late. He told us some distressing news. 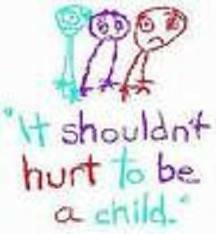 Melanie was forced to use Sanitary towels and dish clothes to dress her leg ulcer and was not in a good way mentally being abused and bullied ongoing. 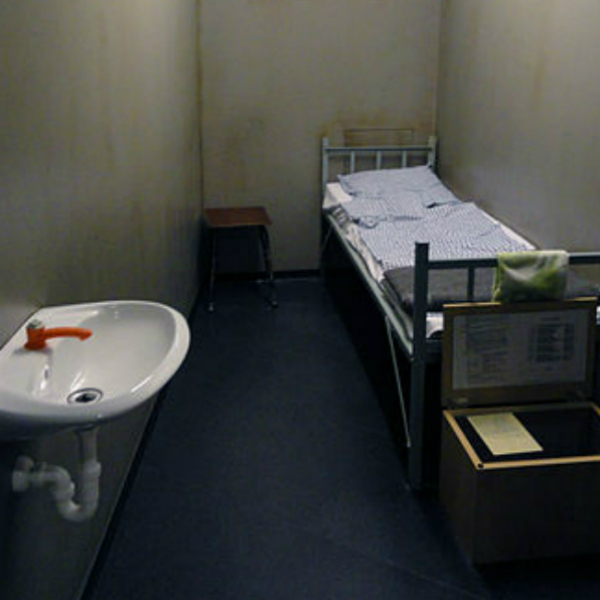 Brian also told us of some other atrocities happening within the Walls of Sodexo HMP Peterborough that I cannot repeat at this time but there have been several deaths. As Brian was talking a lady called Belinda McKenzie passed some flyers out for her organization “Battle of Britain’s children 2014” and she also collected names and contact details in the hope she could get a national activist entity formed to tackle child abuse. I have to say I am sceptical to this woman’s motives but wont say more here please goggle for that its all out there. She then addressed the crowd after Brian speaking rather well. As the morning turned into afternoon sandwiches started to emerge from bags and many members of the public came by to enquire and there where many groups of us on the park holding our banners high and talking about various subjects including the ghosting of prisoners and how private prison that are run for profit are very dangerous indeed, in the U.S.A there laws require these private prisons to be 95% full at all times! To be honest we talked about so much ive forgotten more than I can recall. The police facilitator was there, he was not Stuart but I forget his name he seemed pleasant enough wearing his blue tabard that sometimes covered his camera. After dinner into the afternoon we decided to take a stroll to the prison entrance directly in order to alert Melanie and the other prisoners to our presence in order they might gain some hope that people on the outside care about there situation. The police Facilitator (who is not Stuart lol) accompanied us all the way and we stopped to pose for photos at the prison entrance as a marked police car came past and did a uturn before parking up to monitor us. Before moving into the premises of the car sales company “Winstons motors”. It was very kind of the Police facilitator to approach Winstons motors on our behalf to gain us peaceful entry into there premises. We assembled opposite the prison area where we believed Melanie was detained and we posed again for photos and chanted “free Melanie” a couple of times before singing her happy birthday which Brian led. At this point we heard some whistling from the prison and Melanie managed to shout really loud several times “thank you” which touched us all and made the day seem even more worthwhile. 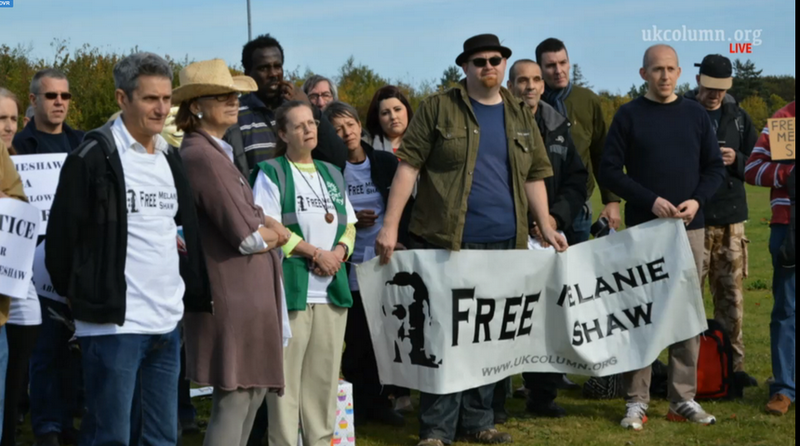 We all were in no doubt that our actions on that day at the very least lifted the spirits of Melanie and others in that prison detained without evidence of committing crimes and informed the authorities that a significant number of people care enough to do something about it. After a while and more chatting to the public and amongst ourselves we all moved back to the park and the Halcyon pub, it was now 3pm and many including Brian headed to the pub for a well deserved pint but sadly I did not leaving with a new friend who offered a lift home but not before saying bye to Brian and some others. 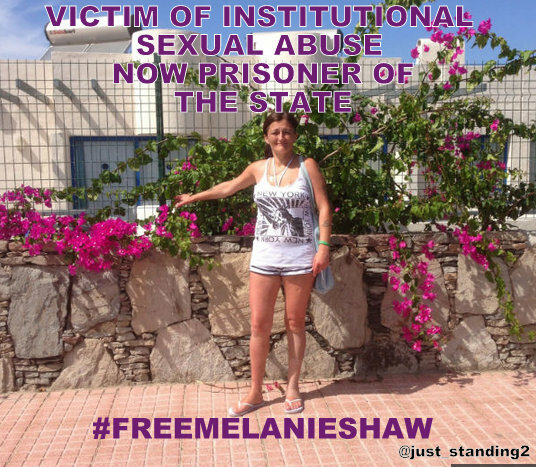 Melanie Shaw, a vulnerable abuse victim and vital abuse whistleblower, remains in high security prison HMP Peterborough, with no substantive evidence against her, no proper NHS medication that she has taken daily over many years, no treatment for her leg ulcer, no access her psychiatrist, no visits from her family, interference with her mail, bullying from prison warders, a national mainstream media black out and a stunning silence from her MP Chris Leslie and other MPs. 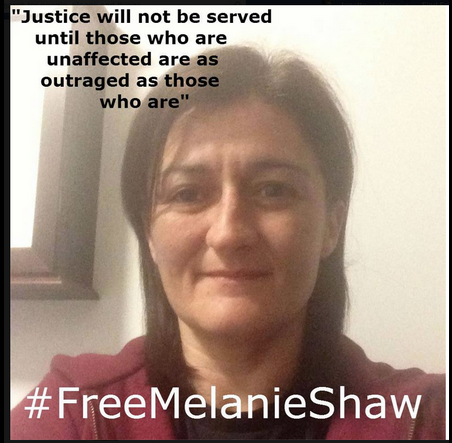 On 11 July 2014 Melanie Shaw, a survivor of abuse at Beechwood Childrens Home, Nottingham, was arrested on charges of arson of a neighbour’s shed, a charge that she denies. Nottingham police initially refused to say she had been arrested, and only admitted she was held in custody after numerous calls from the public who were concerned at her disappearance. Police police later seemed confused over the date of the alleged arson offence, publicly quoting both 1 February and 4 April 2014. At a hearing at Nottingham Crown Court on 25 July the prosecution failed to present evidence, despite the Judge prompting them with references to a finger or palm print. In what was described as a fumbling statement to the Judge, the prosecution excused the lack of evidence and promised it would be available ‘shortly.’ Despite the absence of evidence against her, her status as a vulnerable abuse victim and her importance as a key witness to widespread child abuse, the Judge was happy to place Melanie on remand, at a prison in which she has already suffered bullying, strip searches, denial of her NHS medication and disorientation through repeated relocation between cells. Her defence team failed to communicate with her and failed to challenge the lack of evidence. At no point was Melanie asked to speak in her own defence. 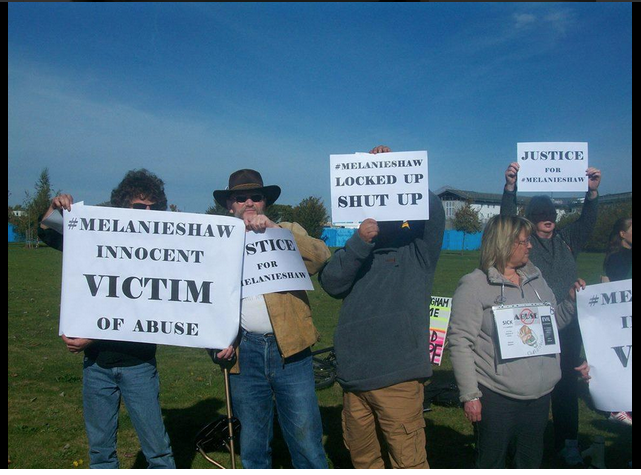 Melanie had stated just prior to her arrest, that Nottingham police had failed to properly investigate both the widespread child abuse, and the deaths of numerous children within the ‘care’ of Nottingham City and County Council at Beechwood and other homes. Note that Nottinghamshire police have used arson charges before to smear a witness’ name. There were several flaws in the legal process, but she is remanded in a prison, Peterborough, where bullying is rife. She says she is not being given her Valium. If so, this is of grave concern, as it will at best cause discomfort, and at worst cause seizures which could be fatal. Melanie was told to expect a “direction hearing” on 12th Sepember. She prepared for it, but was then told that it was cancelled because the judge was on holiday. She has discharged her legal team for incompetence. Campaigners should get a legal opinion on whether a writ of Habeas Corpus should be issued for Melanie. 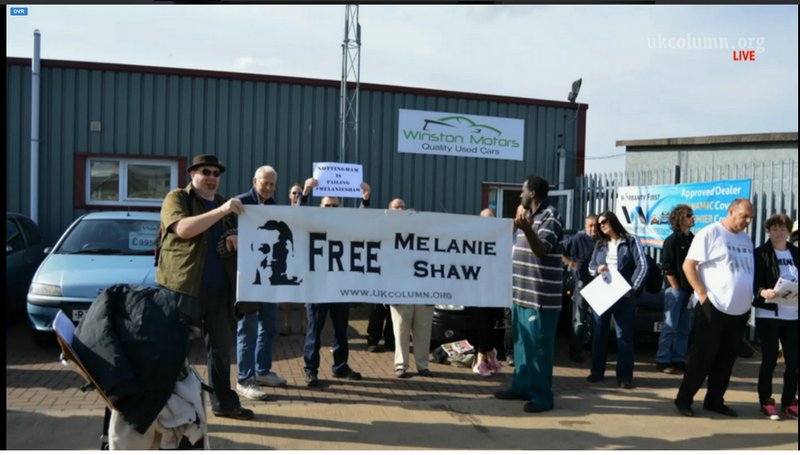 22nd September 2014: Melanie was on hunger strike, though this is reported to have stopped shortly after. Here are sample letters to Melanie and the Director of HMP Peterborough. I am so sorry to read on the internet about your case. Be assured that there are a lot of people out here who know about you, and are rooting for you. There is a petition on the Web calling for your release. As a retired doctor and Chair of Battle Against Tranquillisers I am concerned to read that you are not getting your regular dose of Valium. This must be making you feel awful. I will be writing to the Governor of HMP Peterborough to ask him to restore your dose, and to make sure that you are treated as the important and well-known person that you now are. Remember – you will be released, you will have freedom again, and in the end, you will get justice. It will take time. Just be patient and always remember this bad time will pass. I enclose a book of 6 first class stamps. 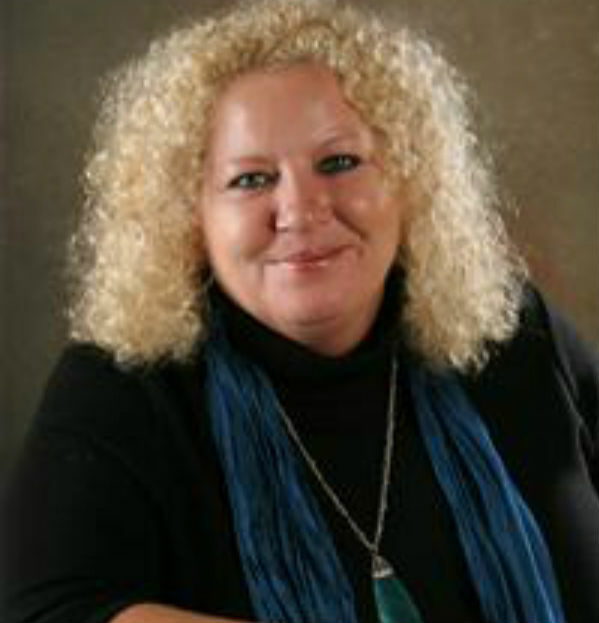 In common with an increasing number of people I am aware of this lady’s status as an important witness to historic abuse in a Childrens Home. I am very concerned for here welfare, and am writing to make sure that she is not harmed in any way while on remand in HMP Peterborough. As a retired doctor and Chair of Battle Against Tranquillisers (www.bataid.org) I am concerned to read that Melanie is not getting her regular dose of Valium. At best, this may be making her feel extremely anxious and ill. At worst, it puts her at risk of seizures, which carry a risk of death. I would respectfully ask you therefore to instruct the prison medical services to restore Melanie to her previous dose, and if it is decided to reduce it, to do so very gradually indeed, in line with current practice guidelines. Thank you. Please also ensure that Melanie is not bullied or abused. As a survivor of past abuse in her childhood, she will be very vulnerable emotionally and physically to any threat of this kind. Thank you for giving attention to Melanie’s case.